Make your own household cleaner! One of the first things I did away with in my house was all the nasty chemical filled cleaners. The only chemical cleaner left is Windex, and that is only because my husband refuses to give it up. There are a lot of chemical-free, natural cleaners out there and I have tried a few. The Seventh Generation and Method cleaners work really good. Clorox Green Works also works well, but I am still a little skeptical about it. But I’m weird like that. Honestly though, the all-purpose cleaner that I like the best is the one I make myself. No I am not crazy! It’s super easy to make and super cheap as well. So here is my recipe, give it a try and I promise you will love it! You will need: a 24oz spray bottle, distilled white vinegar, water, natural liquid soap and your favorite 100% natural essential oil (optional). 1. Spray bottle. Make sure you buy a new spray bottle. Do not reuse an old bottle from another cleaner, even if you rinsed it out. You don’t know what kind of chemicals will be left behind or how they will react with our concoction. You can get them pretty cheap. I bought mine at Wal-Mart for under $2.00 and most dollar stores sell them too. You will fill the bottle with about 20oz of water. 2. Next you will put in about 2oz of distilled white vinegar. Vinegar is super cheap. The gallon container that I keep in the house is usually around $1.50. Why are we adding vinegar to our cleaner? Vinegar is a natural disinfectant and cuts through grease nicely. Now the smell might not be your favorite, so that is where the essential oil can come in later. 3 . 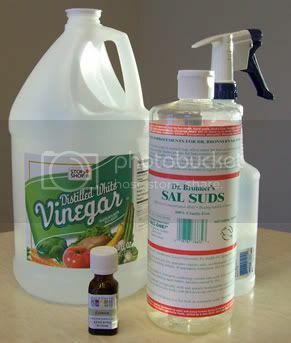 Now you want to add a couple of squirts of your favorite natural liquid soap - I do about 3 good squirts. I use Dr. Bronner’s Sal Suds and many ladies I know use one of the Dr. Bronner’s Magic Soaps (castile soap). The Sal Suds has a pine scent but the Magic Soaps comes in a variety of scents – I have the citrus which is nice and many people rave about the peppermint. Some of the Dr. Bronner's soaps are sold at Target. 4 . Now you can add some essential oil to make your cleaner smell nice. This is optional, you may be perfectly happy with the smell of the mixture you already have. Personally, I am not all that crazy about the pine smell of the Sal Suds so I use some Lemon essential oil. Another favorite of moms is Sweet Orange. Add about 5 drops. Note: Be sure that what you have is essential oil and not fragrance oil. Many fragrance oils contain synthetic scents which I like to avoid. Now screw on the top and give it a gentle shake and you are almost ready to go! 5. Finally, it is very important to label your bottle and all bottles with the ingredients. That way you and other members of the house know what is inside and if god forbid a child should ingest it, you can tell the doctor or poison control exactly what is inside. Be sure to keep all cleaners out of reach of children. Once you do this, you are done!!! Happy Cleaning! Extra! What makes this even better and even “greener” is to stop using paper towels and switch over to reusable microfiber cloths. If you head over to the automotive section of Wal-Mart, you can get a pack of 8 for only a few bucks. They can be thrown in the wash, just be sure you do not use chlorine bleach, fabric softener or dryer sheets as they will reduce their absorbency. I wash mine with my other towels and then hang them to dry. Extra! Extra!The same ingredients also makes a great solution for cleaning your floors. Get out your big bucket and mix hot water (enough to fill the bucket to your desired level) and about a cup of vinegar. You still only need a few squirts of soap and a few drops of essential oil. This works great on our ceramic tile and wood floors. Happy mopping! Do you have your own cleaner recipe that works great for you? Please share it with us! Would you mind answering, Does the soaps included in your mixture leave a residue behind? On the counter mix and the floor mix, I have tiles everywhere! And your dish soap, are you talking about a tablespoon, more or less?? Thanks in advance! Love your tips!! I've never had any issue with residue left behind. I used to have a problem with that on our hallway tiles before I switched to this. I honestly have never used either of these soaps for a dish soap, but I know the Sal Suds label says that a tablespoon will clean an entire sink full of dishes. I'm not completely green when it comes to my cleaning. Do you think the Dr. Bronner's (which I have some of) works better than dish soap since it's non sudsing and shouldn't leave a residue?